I’m going to be the Devil’s (2) Best Man…. It’s true, but not exactly what you think. I have two friends I met through the Navy that I have known for years. The three of us, me, Mike G, and Dave, are more commonly referred to as ‘The Devil’, ‘Splash’, and ‘The Devil(2)’. 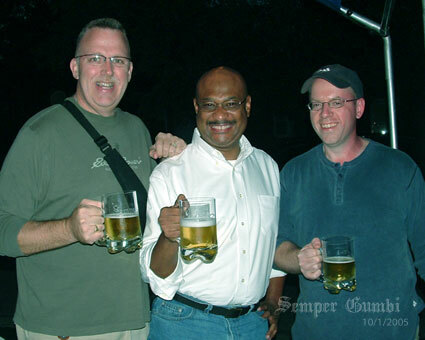 Me, Mike, and Dave at LobsterFest in 2005. Splash nicknamed himself. Being the only black man that puts up with our antics and still hangs out with us anyway, he dubbed himself our ‘Splash of color’ and it stuck. Dave nicknamed me the Devil because whenever we hang out and he gets into any trouble, he says I caused him to do it. I realized the same goes for him and I, he being the root cause of the evil I get into to, so he has been labeled the Devil2. Not any real trouble mind you, more like childish college pranks like the time Mike and I drank shot after shot of water as we fed Dave shots of tequila, you know, stuff like that :). Well after years of abuse about his bachelorhood, Dave has actually met a woman willing to marry him. I have joked many times throughout the years that if he ever managed to do that, I might consider being his best man knowing all along that he wouldn’t choose me. He has brothers and other friends that live right there near him (he lives near Pittsburgh and I am out here near Dayton) who would be more obvious choices for that illustrious position, he had even said so in the past. Well last night Dave popped the question… not to the woman, she had already said yes, but to me about being his best man. I was floored, literally, and if I could be serious for a moment (I know many of you wonder that too), his asking actually brought a tear to my eye. I of course said yes… I am truly honored that he chose me. I wonder what mischief the Devil can bring to a Bachelor Party. Posted on January 2, 2006 April 13, 2013 Author MikeCategories friends2 Comments on I’m going to be the Devil’s (2) Best Man…. He comes in holding this apple that she has ‘peeled’ and says ‘what does this look like to you?’ I saw it right away, a map of North America. I know what you’re thinking, the daughter was just being clever. Well, she is that, but she is 6 and thinks Ireland is a state and Indiana is a whole other country. 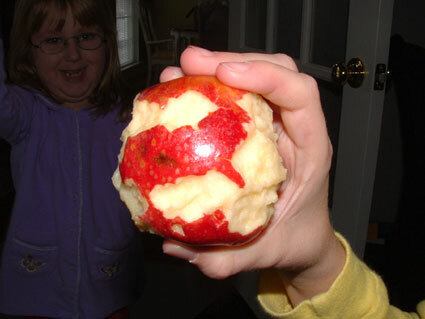 She might recognize the US on a map or globe but she couldn’t recall it well enough to chew an apple skin off to recreate it with the peel. So, I thought this was a rather cool event and I documented it electronically for posterity sake. It has been provided below for your viewing pleasure. It’s got everything, Maine, Florida, and Texas, a skinny Central America and even the top of South America. All in all, a fairly excellent job if I might say so myself. And if you look hard enough, you can see my baby in the background grinning with excitement at the enthusiasm her Dad showed at her remarkable feat. Posted on December 23, 2005 April 13, 2013 Author MikeCategories family, parenthoodLeave a comment on As American as apple….